Venture into the magical landscape of the Old Kingdom for three spellbinding tales of discovery, destiny and danger. 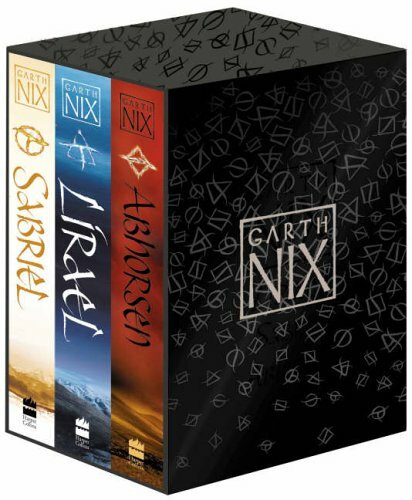 This stunning boxed set contains Garth Nix’s bestselling Sabriel, Lirael and Abhorsen. A young girl discovers her destiny is to take on the duties of the Abhorsen and protect the living from Free Magic and the clutches of the Dead. As an ancient evil casts its shadow and threatens to break the very boundary between Life and Death, Lirael is forced from her position as Second Assistant Librarian to confront the power that is rising. The Destroyer is awake and summoning forces more powerful than any before. Can Lirael – newly appointed Abhorsen-in-Waiting – and her small team hope to find the clue that will lead to the downfall of this mighty force? And if so, can they defeat it and save the Old Kingdom from this ultimate evil? If you were stranded on a deserted island, what 3 things would you want to have with you? 1. "The How to Survive on a Deserted Island Manual"
Usually between 4:45am and 7:00am depending upon my young son. Preferably closer to 7:00am! No pets, unless you count the two swallows that are building a nest under the canopy above my office door. Maybe I should give them names. What are 3 things you love about where you live? Did you like school? What was your favourite subject? I sometimes liked school. My favourite subject was History. Or maybe English. Or Drama. When did you start writing and what gave you the inspiration to start? I started writing stories when I was six or seven, but didn't seriously try to write and get published till I was nineteen. What do you like to read? And what book are you reading now? I like to read all sorts of books. I'm currently reading a history of Venice by John Julius Norwich. What was the first book you can remember reading? What is your favourite TV programme and pop band? My favourite TV program is an old one, Dr Who. My favourite pop band changes, but I guess my all-time favourite would be The Beatles. If you could travel back in time, who would you be and why? I would like to be all sorts of people, but I wouldn't mind being a long-lived, healthy medieval king who died in bed at an advanced age, mourned by all. If you could be invisible for the day, where would you go? What is your ideal Saturday/weekend? If you had 3 wishes from a genie what would it be?